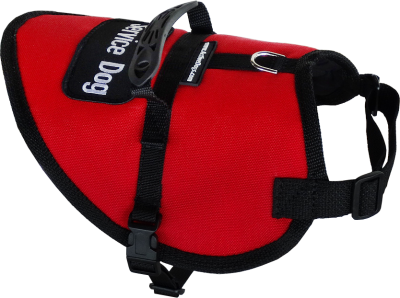 Our Small Dog Vest with Handle is designed for the small/med working dog. The outer layer is made from durable, weather resistant 1000 denier fabric. The front chest strap is light weight webbing for extra comfort it is also adjustable. There is a D-ring on the top of the vest for attaching your leash or ID tags. The vest is lightly padded and lined for your dog's comfort. This vest allows your dog good mobility and great identification as a working dog. On the 4XS, the front chest strap is made of elastic material. The comfortable molded rubber handle is extremely durable and allows you to easily maintain control of your dog. This vest comes in 4 Sizes, and 13 Colors! !